I admit it: I’m really particular about what I feed my birds – their regular diet doesn’t contain any peanuts or any dry seed, they get very little (if any) grains, are never fed anything containing soy, and (with the exception of my Cape parrot) they get very few nuts. The only pellets they recieve are Totally Organics and I don’t supplement their diet with any artificial vitamins or minerals. I’ve been told, time and time again, that I’m too picky about what I offer them by everyone from fellow bird lovers to my co-workers at the bird store. But I don’t feel that way, at all. In fact, I wish more people were more particular about what they fed their birds, because what we offer them impacts everything about them from their appearance and health to their hormones and their behavior. Now, hopefully, we all know that seed-only diets are bad news for parrots. But incase you forgot, I’ll explain why. Most seed blends consist primarily of sunflower and/or safflower seed, millet, oats and/or oat groats, dried corn, buckwheat, peanuts, and dried peppers. 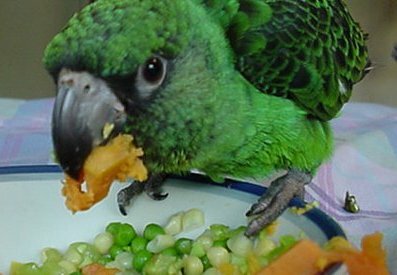 Even if your parrot consumes every bit of food in the mix, this is not a nutritionally sound or complete diet, even if the seeds are “fortified”, because the “fortification” process involves spraying a vitamin and mineral mixture onto the seed hulls, which are discarded by your bird. Since birds don’t have saliva, they don’t actually consume much (or any) of the sprayed-on supplements. But let’s take a look at some popular commercially available pellets, and how they can impact our parrots’ in more ways than one. To understand what those ingredient lists really mean, we need to first understand how to read them. What this tells us is that Zupreem FruitBlend is, essentially, ground grains with vitamins, minerals, and flavors added. It contains both artificial colors and artificial flavors. It (along with most other commercially available foods) also contains “Menadione Sodium Bisulfate Complex“, an artificial source of vitamin K (“vitamin K3”) which has been linked to liver damage, irritation of the skin and mucous membranes, and immune system weakening, and has never been approved for long-term use in pet foods. It is banned as an additive or supplement to foods intended for human consumption because of it’s potential toxicity. The other Zupreem blends – including the new Veggie and Nut blends – read much the same. It’s also interesting to note that the NutBlend doesn’t actually contain any nuts, but does list sugar quite high on their ingredients lists. Despite being a common and popular food, recommended by pet stores around the country, I (and many others) would not consider it a quality diet by any means. What about so-called “high-quality” foods, like Harrison’s Adult Lifetime? Though the ingredients list contains some better ingredients than Zupreem, and there is no artificial Vitamin K, it is still a diet based on grains. The main ingredients are ground yellow corn, ground hull-less barley, ground soybeans, and ground peanuts (the first named fat source.) The remaining ingredients are reasonably good ones, including alfalfa, montmorillonite clay, and sea kelp (a natural source of vitamin K.) It is a significantly better food than Zupreem, but it is still mostly ground grains with items added for their flavor or vitamin/mineral content. Even though Harrison’s is a higher quality – and far superior – diet than Zupreem, it is still far from an appropriate staple diet for our companion parrots. Want to know why? Stay tuned – in the next post, we’ll discuss why a diet based on grains isn’t suitable for our parrots, and what we can do to feed our flocks right!